Equipment (Don): Wore long pants, short sleeve shirt. Pulled out wind breaker near the top. Wished that I had light weight pair of gloves. It was chilly up top. I also had one ski pole, could have used 2. In terms of cloths, if you are starting out in shorts at the bottom, you will want to have something in your backpack to convert to longs as you approach the top. This applies to both pants and shirts. John was cold with just a shirt and a wind breaker on top, and it was 95 in Denver at the time. On July 9, a gorgeous day, John Drake and myself did our 2nd "Fourteener", Mt. Bierstadt. We left John's house in Ruby Ranch by car at approximately 6:45 am. We drove east on I-70, getting off at the Georgetown exit. We followed the signs in Georgetown to get us on the road to Guanella Pass. We arrived at the pass, and started our hike at 7:50 am. As usual on these hikes, I passed no one going up the mountain, and had plenty of people pass me. 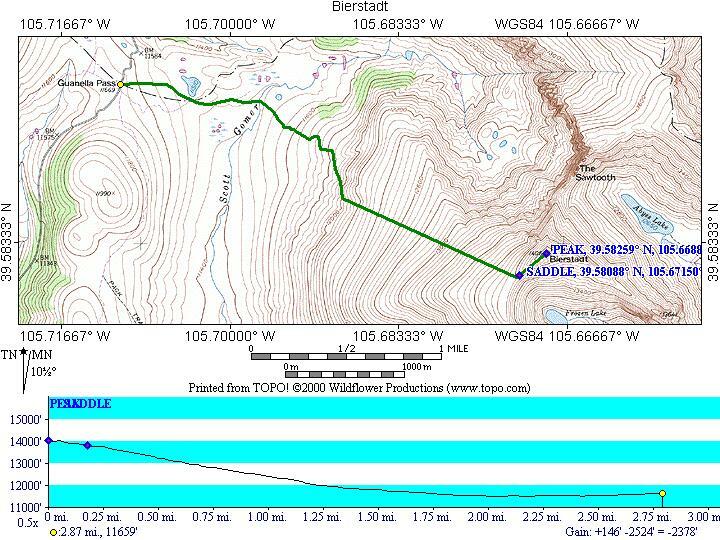 Here is the sketch of our hike from the Wildflower topo software. This was an easy one to make as the whole map is contained in one of their regions. In making this map and profile, you will note that the profile is backwards. This is because I saved the track log on the Garmin at the peak and re-started it for the descent. In comparing the two logs, I liked the descent better. I don't know how to invert the profile in the Wildflower software. Anyway, as you can see, the hike actually starts out with a descent, before beginning the ascent to the summit. The hike starts off above timberline, and descends through Willow bushes. The low point of the hike is reached when "Scott Gomer Creek" is crossed. This was the only significant water that we encountered on the hike, and the crossing was easy. The Willows continue until basically where the route becomes a straight line heading ESE. At that point it is just alpine meadow until the "Saddle". One is not fooled by false summits on this part of the hike, but rather false ridges. I took 50 steps and rested, and eventually conquered the slope. John, as usual, raced on ahead, and reached the summit 25 minutes ahead of me. Right before the "Saddle", the meadow turns to a scree field. This scree, however is not loose, so I had no problems either up or down. From the saddle to the summit is also scree field, again not loose. At the summit, there is a USGS marker and a book to sign in. Proof that someone (me) was at the top. The view from the top was outstanding. Although the usual haze was around, you could see Pikes Peak as well as Denver and the plains. This picture will give you an idea of the scree. John was more nervous about this than I was. I think I was suffering from the altitude. John points out he would not take a small child up to the top. The summit is off to the upper left of the picture. I don't know who these to gentlemen are, but I told them I would post the picture with them in it. If you look carefully over my hat, you will see a lake and a road just beyond. That is where the car was parked. On the way back down, once I entered the meadow, I took out my camera and tried for some good pictures.